The ruinous remains of a sixteenth century Tower House that occupies the site of a former promontory fort. The structure is unstable and access to the interior has been bricked off. Nevertheless the exterior can be viewed and on a clear day there is an excellent view towards Arran. Notes: Castle is not sign-posted but is relatively easy to find as it towers over the beach at Doonfoot. Car parking is available off Greenan Road. For those planning to climb to the castle, sturdy footwear is recommended. Tower House. The interior has been gutted but the location of the turnpike stairs can be seen in the bottom right. Perched upon the top of a sea cliff, Greenan Castle occupies a site that has been fortified for thousands of years. Originally a promontory fort, it was converted into a motte-and-bailey in the twelfth century. In the fifteenth century a Tower House was built by the Lords of the Isles which later passed into the hands of the Kennedy family. A promontory fort enclosing around one acre was the first known defensive structure on the site of the later Greenan Castle. Four concentric curved ditches, each around 3 metres wide, cut off the headland with the exception of a single causeway to provide access. Probably a fortified farmstead, it is not known how long this settlement was occupied for but the site was re-used in the twelfth century. At this time an earth and timber motte-and-bailey was raised on the site probably by one of the immigrants encouraged to settle in the north during the reign of David II (1124-53). By 1190 it was in the hands of Roger de Scalebroc - a vassal of Donnchadh, Earl of Carrick - for a charter records him granting fishing rights to the monks of Melrose Abbey at this time. 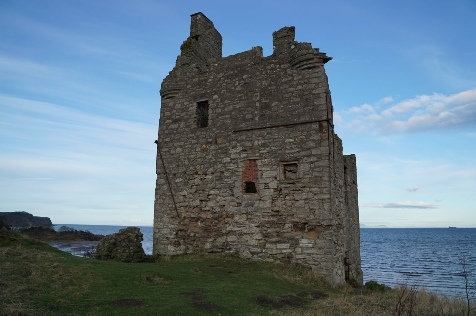 Ownership of Greenan in the following three centuries is unclear but in 1475 it was in the hands of John, Earl of Ross and so-called Lord of the Isles. He granted the lands to his esquire, John Davidson, who managed to retain them despite James IV taking control of the Lordship of the Isles in 1493. 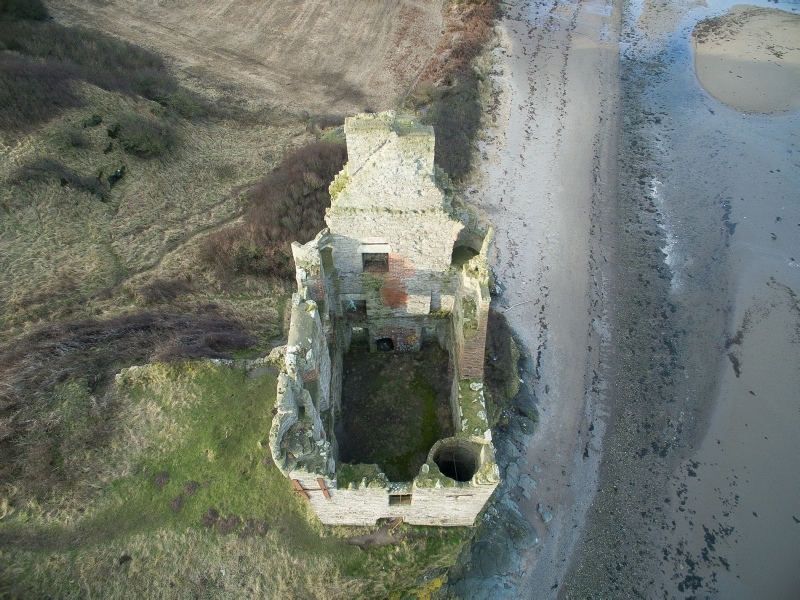 A record from 1510 lists the owner of Greenan as Thomas Davidson and it was perhaps he who built the castle seen today on top of the earlier fortifications. The new building was a three storey (plus attic) Tower House. It took the traditional form - the basement was a vaulted storage area, the Great Hall was on the first floor with accommodation above. Access into the tower was via an external wooden stair to a first floor door that led directly into the hall. An internal turnpike stair, embedded in the thickness of the wall, allowed access to all levels.